I am very glad to see here so many representatives of partner companies from different countries and regions of the world. 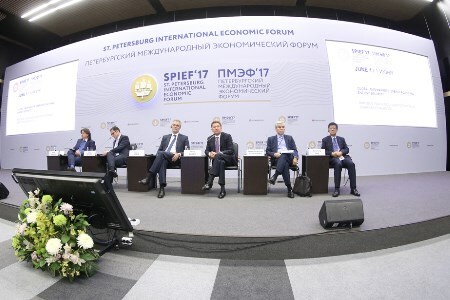 It means that the St. Petersburg International Economic Forum is a key platform for energy discussions. The global gas market grew by 5.5% in 2016. In terms of worldwide sales, the ratio of pipeline gas versus liquefied natural gas (LNG) was 69 - 31%. This ratio – 70 - 30 – has been stable in recent times, without any major changes. And we know perfectly well that LNG and pipeline gas are just different forms of methane transportation. In the first case, it is by a gas carrier; in the second, by a pipe. There is a commonly known dependence between the distances and volumes making either pipeline gas or LNG competitive. It is clear that the greater the distance is, the less attractive pipeline supplies are. But with large volumes, pipeline supplies are more economically attractive. The 70 - 30 ratio therefore shows that most of the world's gas is consumed at a distance of less than 4000 - 5000 km from the production sites. Also, pipeline supplies account for the lion's share of global gas trade. The growth in LNG trade proves without a doubt that the LNG market is becoming more global and an increasing number of countries rely on this energy source in their energy strategies. The European market is the main market for Gazprom. It is our number one market. We have been working there for almost 50 years. And, of course, we are heartened by the significant rise in Europe's gas consumption over the course of 2016. The European market grew by 6.9%. Moreover, Europe boosted its imports by 11.1%. As you can see, import growth exceeded consumption growth due to a number of factors. Firstly, it is the factor that everyone in this room is well aware of: a continuing downward trend in Europe's gas production. And secondly, it is the fact that gas is gaining more ground in the power industry. Speaking about the European market, gas consumption in the power generation sector added 8.4% in 2016. As you can see, this figure is even higher than the increase in Europe's gas consumption. It should be noted that some European countries achieved truly impressive results. Take, for instance, the reduced share of coal-fired power generation. I'm talking about the UK. In the space of one year – 2016 – the UK's coal-fired generation shrank from 23 - 9%. Coal-fired capacities were mainly substituted by gas-fired ones. In that context, Gazprom ramped up its gas supplies to Europe. As you know, 2016 was a record year for the Company in absolute terms: we exported 179.3 billion m3 of gas to the European market. It is a 12.5% increase from 2015. But I believe that the absolute growth in gas supplies in 2016 was even more impressive: 19.9 billion m3 of gas. Furthermore, the upward trend in gas exports at higher rates and in larger volumes has been steady since early 2017. Starting from 1 January, Gazprom's gas supplies to Europe have added 9.5 billion m3, or 13.3%, compared to the same period of last year. What does it mean? It means that, in just one year and five months, the amount of Gazprom's deliveries to Europe increased by 29.4 billion m3 of gas. Please note that 29.4 billion m3 of gas equals 53% of the design capacity of the Nord Stream 2 gas pipeline. We will put that pipeline into operation in late 2019, in about two and a half years. If the demand for Russian gas continues to climb at the same pace as in the past year and a half, then it is likely that even Nord Stream 2's capacities will not be enough to meet the rising demand for Russian gas in the European market. The growth in our gas supplies to Europe was accompanied by a reduction in gas deliveries from Norway, the Netherlands, and Qatar. In 2016, Qatar's gas exports to the region fell by 4.4 billion m3 compared to 2015. The reasons for that are well-known: those volumes were redirected from the European market to the more marginal Asian markets. And this trend persists. In 2016, LNG supplies to Europe decreased by 1.9%, or 1.1 million t.
It should be noted that the upsurge in our gas supplies is taking place in the countries representing the target markets for the Nord Stream 2 project. In what countries do we observe largest growth rates? In Germany, of course. In 2016, our gas exports to Germany added 10%, nearing 50 billion m3 at 49.8 billion. What is even more impressive is the amount of gas supplied to Germany this year: an increase of 15.6%, or 3 billion m3, in the first five months alone. Gas deliveries to such markets as the UK, France, Holland, Denmark, Austria and Poland grew at a fast pace in 2016 and continue to grow. In addition to the absolute records in terms of annual supplies, throughout the past winter Gazprom set records in its monthly supplies for four months in a row, first in October 2016, then in November, December, and, finally, in January 2017. The January amount – our absolute record – was 19.1 billion m3. However, the most remarkable results were achieved in daily supplies. On 27 January 2017, we exported 636.4 million cubic meters of gas to Europe. It is the peak level of supplies. It exceeds the 2015 – 2016 winter peak by more than 100 million m3. And how do matters stand now? As of today, 1 June, the amount of gas exported by Gazprom to Europe totals 543 million m3. You know, here at Gazprom we have an inside joke that, no matter the weather, it is now the eighth month of winter. Those are absolutely winter-level supplies for Europe. We have never dealt with such huge quantities before. Of course, as a supplier – a reliable supplier – we are happy about that. But we should also understand that the relevant infrastructure projects have to be put into operation precisely within the intended timeframes. As for the past winter, one should take into account the conditions some European countries found themselves in on certain days. For Germany, it was 24 January. Everybody knows what happened there. Renewable energy covered a meager 4% of the country's daily needs. Take Austria, whose gas imports grew fourfold compared to the amounts considered, so to say, usual for the autumn/winter period in the Austrian market. We know what happened in France, when, in the abnormally cold weather, NPPs were out of service due to scheduled maintenance, which prompted a hike in gas supplies. Most importantly, gas reserves stockpiled in European UGS facilities dropped to an all-time low by the second quarter of 2016. Only about 25% of gas was left stockpiled. It goes without saying that in the ongoing discussions with our European partners we will pay even greater attention to gas injection in European UGS facilities. It is already evident that natural gas from European UGS facilities will be in even higher demand in the winter of 2017 – 2018 than in the past winter. How did all this affect the prices? We have already heard Mr. Grivach discuss spot deals in his opening speech. Spot trading has proven to be ineffective during peak demand. First of all, there is no available gas for consumers in spot markets during peak demand. That makes prices go up immediately. In that period, spot prices were considerably higher than the prices under Gazprom's long term contracts. They were higher by tens of percent. The calls for spot trading and its very notion represent an attempt to do away with oil-indexed prices. However, if we look at the overall price correlation in the spot market, we will see that those prices basically follow the fluctuations of oil and petroleum product prices. What conclusions can be drawn from this? Just one: right now, we cannot rely on spot trading in European gas hubs for consistent and stable pricing, and the past winter is a case in point. Concerning our gas transmission strategy. Gazprom's gas transmission strategy is undoubtedly linked to our gas production centres. Besides the Nadym-Pur-Taz region that has been our main gas production centre for the last forty years, Gazprom began operations in a new gas production centre based in Yamal. Year by year, we step up our gas production efforts at the Bovanenkovskoye field, which forms the basis for the Yamal gas production centre. This also means that we build new infrastructure to supply gas to our consumers. These are the Bovanenkovo–Ukhta, Bovanenkovo–Ukhta 2, Ukhta–Torzhok and Ukhta–Torzhok 2 gas pipelines. The northern gas transmission corridor, which runs across the Russian Federation, has become central to ensuring gas supplies and distribution for domestic consumers, transforming the geography of gas flows and reducing the utilization of the central corridor, which used to be the main transmission thoroughfare. As you know, the central corridor stretches to Uzhgorod and further to Europe. After reducing its utilisation, Gazprom makes consistent efforts to decommission the central corridor's excess gas transmission capacities. The work we started recently will help us save US$1.6 billion before 2020 thanks to the decommissioning of gas transmission capacities in the central corridor. The shifting production centres and the changes in the utilisation of transmission corridors across Russia lay the groundwork for the creation of gas export transmission corridors. The northern corridor becomes the backbone for supplying gas to Europe. Both the Nord Stream and Nord Stream 2 projects are the logical extension of the Russia-based northern gas transmission corridor. If you look at a satellite image – and not at a map – you will see that the Yamal gas production centre and Greifswald are connected by a straight line, which is almost 2000 km shorter than the gas transmission route to the European market across Ukraine. Our new gas trunklines in the northern corridor are the most advanced in the world. They are designed for the operating pressure of 120 atm. What does it mean? It means a greater distance between compressor stations. It means fewer compressor stations. And, ultimately, it means lower metal consumption in projects and a smaller carbon footprint. Compared to gas trunklines working at 75 atm or 55 atm, gas trunklines with the operating pressure of 120 atm have, without a doubt, much higher economic efficiency in terms of gas transmission costs. However, the central corridor consists of gas trunklines with the operating pressure of 55 – 75 atm. The gas pipelines that are currently in service or under construction are three and six times more cost-efficient than gas pipelines operating at 75 atm and 55 atm, respectively. By early 2020, our efforts in optimising the central corridor's gas transmission capacities will logically lead to the reduction of capacities at the border with Ukraine, leaving enough to transit about 10 – 15 billion m3/y of gas. In order to compare the northern corridor and the central corridor in terms of their economic efficiency for Gazprom with regard to gas supplies to European markets, let us take the annual amount of 30 billion m3 contracted for a 25 year period of gas deliveries to Europe. In the context of such volumes and timeframes, transporting gas supplies via the northern corridor would be cheaper by US$43 billion compared to the central corridor. Add to that the so-called carbon footprint. Today, CO2 emissions from transporting gas to Europe via the northern corridor are 9 million t lower as compared to the Uzhgorod corridor. It is crystal clear. These are the facts that guide us in developing our gas transmission strategy. As regards the Asian gas market: it is nowadays the most dynamic and rapidly growing market in the world, as well as the most promising one. Of course, an emphasis should be placed on the Indian market. However, China is the most important market – the number one market. In 2016, China's gas consumption rose by 7% to 205.8 billion m3. Notably, the country has crossed a significant psychological threshold by exceeding 200 billion m3. Just like in Europe, China's indigenous gas production fails to meet the growing demand. In 2016, China's gas imports added 22%. As you can see, this figure exceeds the growth rate of China's gas demand. At the same time, Chinese gas imports are represented by the 50 - 50 ratio between pipeline gas and LNG. It should be noted that in the past winter China satisfied its peak demand primarily through additional supplies of LNG. And this is what still distinguishes China from Europe that meets its peak gas demand in the winter period through pipeline gas. In fact, there is only one reason for it: unfortunately, pipeline gas supplies from Central Asia, as everyone in this room is well aware of, are unable to cover demand peaks characteristic of consumption markets, and that is one of the reasons why the Chinese market managed to meet the peak demand through additional supplies of LNG. I must say that the contract for Russian gas to be delivered by Gazprom to China in the amount of 38 billion m3/y will surely change that ratio between pipeline gas and LNG. What is most important, I think, is that the Chinese Government is consistent in its efforts to increase the share of gas in the national energy mix. The current share of gas in China's energy mix is only 6%. However, China's next five year plan provides guidelines for raising this figure to 8.3 - 10%. As you can imagine, a mere 1% increase in the share of gas in the country's energy balance in light of such consumption rates means additional need for tens of billions of cubic meters of gas. It is absolutely clear that gas consumption in China will soon reach and even surpass the figure of 300 billion m3. This means, of course, a very large and impressive growth in additional demand, including for pipeline gas. I am very pleased to emphasise that Gazprom and CNPC, our main Chinese partner, have built a very friendly and constructive business relationship within a very short period of time. We have a Strategic Partnership Agreement. In the past years, our strategic partnership with CNPC has taken concrete shape in many dimensions. The co-operation is really strategic in nature. The Power of Siberia gas pipeline – the eastern route of gas supplies to China – is, of course, our most significant and fundamental project. Moreover, we continue negotiations with our Chinese partners to increase gas supplies. Specifically, we have an arrangement to broaden our co-operation on the eastern route. By now, we have started commercial negotiations with our partners from CNPC regarding pipeline gas supplies from the Russian Far East. We plan to agree on the general terms and conditions for gas supplies from the Russian Far East before late 2017. Our strategic partnership with CNPC is mainly focused on pipeline gas deliveries. It is very important that lately we have launched a number of practical and substantive projects in other areas of co-operation. This particularly applies to underground gas storage. Quite recently, we signed three contracts for joint UGS projects at the forum held in China just several weeks ago. We have entered into an agreement on a joint gas-fired power generation project involving the Xinyuan power plant with a design capacity of 900 MW. We have inked an agreement on co-operation in the NGV sector, particularly concerning the construction project for the Europe – Western China highway. Allow me to emphasise that we have made concrete efforts under an agreement with CNPC in the field of mutual recognition of standards and conformity assessment results. This means that our co-operation encompasses logistical issues, including supplies of gas industry equipment. I would like to stress yet again that all these projects and agreements show that Gazprom's strategic partnership with its key Chinese partner – CNPC – has taken concrete shape within a very short period of time. In 1968, Europe, namely Austria, started to receive Russian gas. Next year, we will celebrate the 50th anniversary of supplying gas to Austria and to the European market in general. This is undoubtedly a milestone and a momentous anniversary. We are sure that Gazprom and our European partners will set new records before that anniversary. Moreover, those records are expected in the very near future.